My two younger boys will eat anything with sprinkles on it, whether it’s cookies, donuts, or ice cream, and they would probably even eat their spinach if I sprinkled some colorful jimmies on top. When they saw the photo of these colorful galletas con chochitos on the Saveur website, they immediately asked to make them. Later they giggled and stuck their green tongues out at each other as they nibbled, and of course asked for more sprinkles. 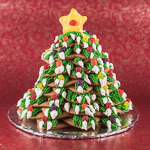 If you need a cookie for a children’s holiday party, this is it. 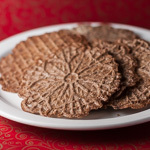 These simple Mexican butter cookies are pretty easy to make, just allow enough time for the dough to chill for an hour before baking. 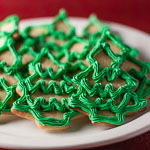 We chose these cookies as part of Cookies We Love, the 2010 version of the annual Christmas cookies fest. 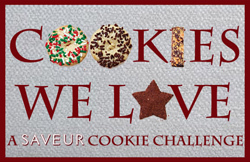 My partners are also baking up a storm, so be sure to visit them to see what’s on their cookie trays. In the medium bowl, whisk together the flour, baking powder, and salt. In the bowl of the stand mixer, beat together the sugar, butter, and vanilla until fluffy. Add the yolks one at a time, beating after each. Then add the flour mixture and mix on medium low until all the ingredients are fully incorporated. Roll the dough into a 12″-long cylinder. Cut the cylinder into 3 pieces and then roll each into another 12″-long cylinder. Slice each cylinder into twelve 1″-long pieces. Roll each into a ball and place on the lined baking sheets, arranging them about 2 inches apart. Flatten each ball into a small disk, then use your finger to poke a hole in center of each disk. Chill for 1 hour. 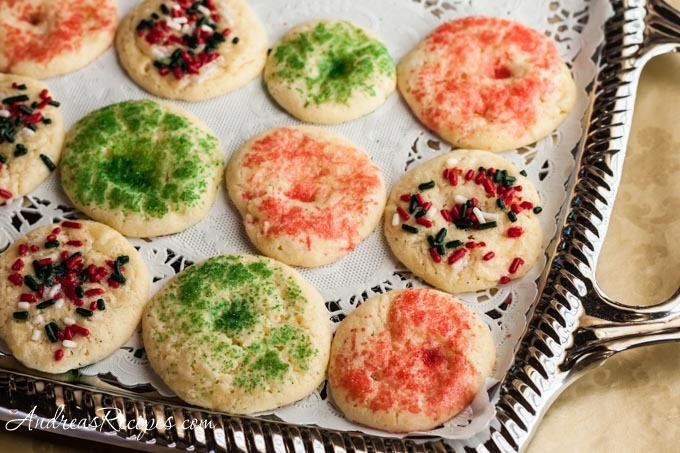 Preheat the oven to 300°F/150° C. Brush each ring with egg white and dip into sprinkles to coat. Return to baking sheets and bake until golden and puffy, about 15 minutes. Remove from the oven and allow to rest on the pan for 2 to 3 minutes, then transfer to a wire rack to cool. Store in cookie tins.